Twenty-six nonprofts have received $62,700 from Tioga Senior Fundation. Distributions are made annually to organizations that serve the needs and interest of older adults of Tioga County, Fifteen board members, from across the county, direct activities of charitable foundation. Tioga Senior Foundation has given over $2 million for projects and services, to nbenefit Tioga County’s older citizens, since 1982. Tioga Senior Foundation actively seeks and gratefully accepts contributions, memorials and bequests. For info on a tax-exempt donation visit: www.tcseniorfoundation.com. 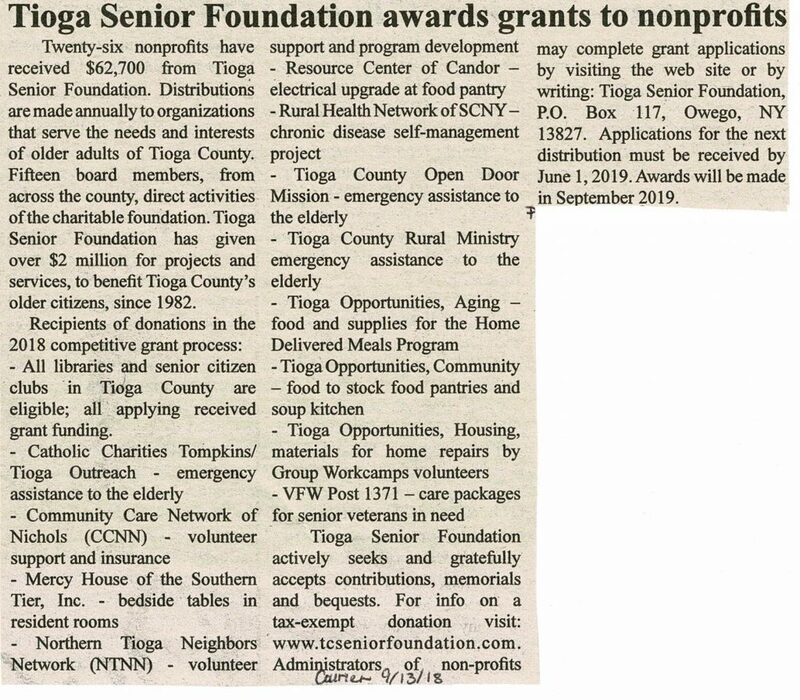 Administrators of non-profits may complete grant applications by visiting the web site or by writing: Tioga Senior Foundation, P.O. Box 117, Owego, NY 13827. Applications for the next distribution must be received by June 1, 2019. Awards will be made in September 2019.